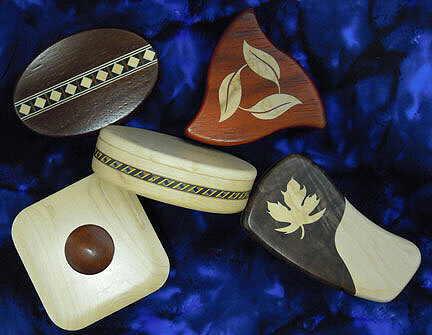 We carry a large assortment of secret boxes by Heartwood Creations. This company makes beautiful wood boxes where the opening is hidden. There are different kinds of wood, sizes, and many have various wood inlays. We have some of their puzzle box line which require various convolutions and rotations to open them. If you have a person in your life who appreciates fine wood or inlay work, loves puzzles or boxes, then these may just be the perfect gift. And of course, you can always place a little something in the box as part of the gift. Being a woman, I’m thinking of jewelry, but I’m sure a gift card or car key would be just as appreciated. Last year, I gave each of my children one of the puzzle boxes, with a new iPod in it. Sure made gift giving simple. Prices range from $56.99 to $59.99. These are quality products, made in the USA. Makes it simple to replace the drawstring in the garment. Hang it on the wall next to the washer/dryer. Place the cone of thread to the side or back of the machine, and place the thread stem on the spool pin or bobbin winder pin. Different machines need it placed in different ways. Easy to take to class. The purchaser knows you’ll be able to buy what you need or want, in the color/style wanted, when you want it. There are no concerns about buying something that is already owned or not wanted. 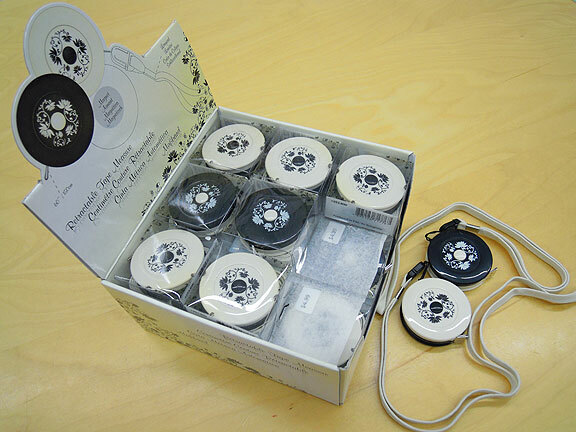 The receiver is given an opportunity to buy their choice of a special item representative of the gift. We have seen purchases of Laurel Burch purses and Jim Shore collectibles made with gift certificates as such a reminder. Others have used them for fabric for a special quilt they would like to make. Some people wait until they find the perfect kit. Harriet Hargrave is an icon in the quilting world, quilting seriously since 1974, opening a store in 1982, and publishing authoritative works, one of which has been in print for 22 continuous years – “Heirloom Machine Quilting”. She was voted one of the “88 Leaders of the Quilt World” in the late 1990s. I’ve been fortunate to take a couple of seminars with her, and the information gained was immense. If Harriet wants to know something, she gets the full story from the manufacturers involved. Harriet’s daughter has joined her in the quilting world by now running the store and pursuing her master’s thesis, “The Physical Properties of Quilting Thread”. She, too, is driven to getting the most information in her field. Both have paired up and are writing a six-volume book series that covers all aspects of quiltmaking from beginner to advanced. These books are not a “pattern” book like many are. They are meant to be completely read, and each volume builds on the skills and knowledge gained from the previous ones. There are quilt projects along the way to practice what is taught. To date, two volumes have been published. 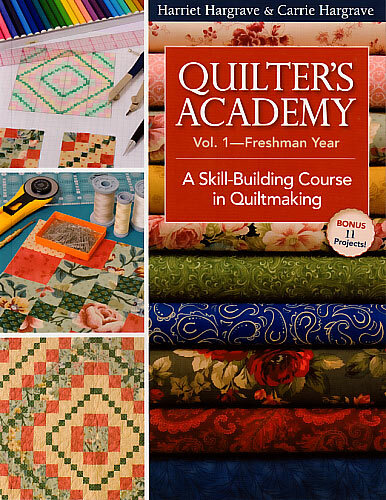 Quilter’s Academy Vol. 1 – Freshman Year starts right from setting up a sewing area, through precision piecing, calculating yardage, to basic binding. 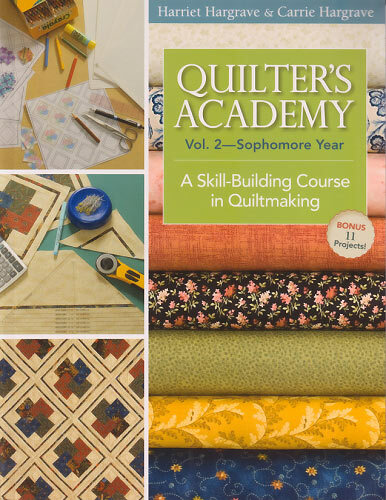 Quilter’s Academy Vol. 2 – Sophomore Year continues with more sewing knowledge, with the projects taking you into the world of diagonal settings. This is the first book I have found that not only covers the math of diagonal settings with and without sashing, but gives detailed instruction on the order of construction of a diagonal quilt. When a customer tells me they want to do a diagonal setting with their blocks, this is the book I recommend they read. 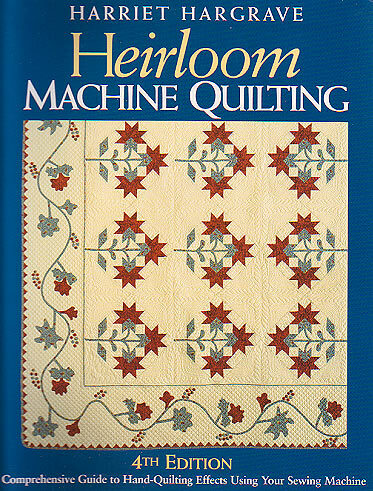 Neither of the Quilter’s Academy books covers machine quilting. This information is found in the book, Heirloom Machine Quilting. You might have experienced this scenario. You carefully trim up the threads of your quilt top before layering it with the batting and backing. But sure enough, after quilting you spot a dark-coloured thread showing through your light-coloured fabric. How frustrating is that! Clover has come up with the solution to this problem, which I’ve put to use on my personal quilts. The Thread Pic is the smallest crochet hook you’ll ever see. It slips between your sewn stitches and you gain access to the netherworld of batting and loose threads. You just hook the offending thread and pull it out or nudge it out of sight. You can also pull broken threads from embroidery to the wrong side where they can’t be seen. 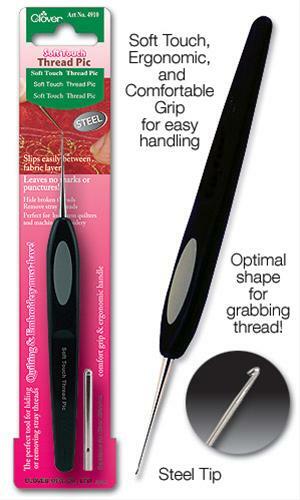 Can also be used for holding your project in place as you stitch (like a stiletto). Use to push edges for quick-turn applique projects. Hook serger tails and hide them in the seams. Comes with a cap to protect the hook. One of the staff here at the store, Pat A., purchased the new Elna eXcellence 740, and when she took it home and showed her hubby, Al Owchar, who is a country musician man, he immediately broke into an old jingle of Elna’s that he remembers from the CFCN Old Timer’s radio show from the early ‘50s. How neat is that! Such memory – and faith to the brand! He’s a keeper. Looks like Pat knows how to pick ‘em. If you would like to see more of Al’s performances, check out YouTube at http://www.youtube.com/results?search_query=Al+Owchar&aq=f. You’ll notice he is listed before Lady Gaga!!! This past year our store became an Elna dealer. 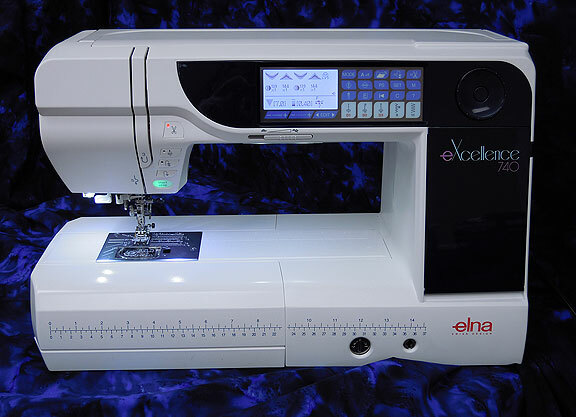 Most people don’t know that Elna has been made by Janome for approximately 17 years now, and just a few years ago, was purchased by Janome. 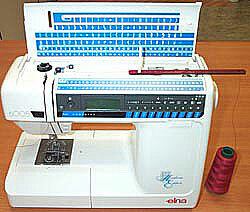 So it has the same great quality of Janome, and many of the machines are similar. Feet, accessories, and bobbins are the same. I’ve uploaded to our website the machines, feet, and accessories we have in-stock. I know that many sewers buy or receive new machines for Christmas, and if you are looking, I recommend you check out what Elna has to offer. The newest machine by Elna is the eXcellence 740. This machine is a game-changer with its very large throat opening, integrated adjustable feeding system, and the many feet and accessories it comes with. And no, it does not have an embroidery component in it, allowing it to be sold for a reasonable price. This machine has 11″ to the right of the needle, and 4.7″ of height space in its harp (a.k.a. throat, arm space), which makes working on any project a dream. You’ll have no problem fitting a king-size quilt or ceiling-length drapes through it. Integrated Adjustable Feeding (IAF) system. This works like a walking foot – but better! And you can purchase extra IAF (known in the Janome work as the Acufeed) feet for special purposes, such as ¼” seam, ditch quilting, and open-toe work. Differential adjustment dial for the Integrated Adjustable Feeding system. 3 storage spaces, including the innovative tilt-forward accessory compartment. (This part of the machine is so fun – it reminds me of a Barbie case, where you can store the shoes.) You’ll be able to store all your feet in the machine. Even the straight stitch plate, which is included, has a storage space. 245 stitches with 11 one-step buttonholes, 2 alphabets, and 26 exclusive Elna stitches. 2 alphabets in lower and upper case, including special European letters and symbols. LED touch screen and tactile jog dial. Thread cutter with memory capability. Adjustable speed control up to 1000 stitches per minute. Adjustable knee lift allows you to lift the presser foot with your knee so your hands can remain in control of your sewing project. This is fantastic when you are stitching machine applique. 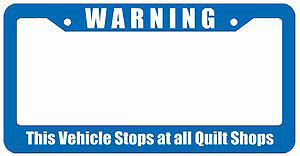 Patented angle line and needle plate markings. 3 banks of LED lighting for better illumination. Automatic thread tension – but can be also adjusted manually. Comes with 15 feet, including the convertible free-motion quilting foot with 3 extra interchangeable quilting toes (this foot is not a hopping foot – you can adjust the height of it so it just touches the top of your quilt). Straight stitch plate; circular sewing pivot pin; semi-hard fabric cover with pockets for foot control, extension cord, knee lift, and manual. Cloth guide fits on the free arm. Adjustable stitch width to 7 mm, and stitch length to 5 mm. Auto-lock key with memory capability. Personal settings capability allows you to store your adjustments and have them automatically recalled when you return to that stitch (even after shutting off the machine). There are other great machines as well; the 5200Q is fantastic class machine or beginner machine. We cannot put pricing on the web. So if you would like pricing, please call us locally at 403-253-4419, or toll-free at 1-877-745-6445. Then Let It Snow! Then I’ll sew! Old Man Winter will Blow! 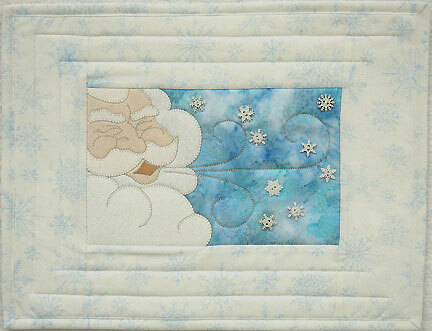 This “Old Man Winter” kit will make either a 12” X 16” applique wall hanging or pillow. The store sample is a wall hanging. Kit includes pattern; fabric for top, backing, & binding; interfacing; decorative buttons; and pre-printed fusible web (so you don’t need to trace the shapes!). All you have to provide is thread and batting. Revelation 1: You should change your machine needle after 8 hours of sewing. This doesn’t mean 8 hours of sewing, pressing, cutting, but after what would be 8 hours of straight sewing. I make it simple by disposing of the needle when I’ve finished my project. Afterall, the needle is the smallest expense for your project, yet one of the most vital to achieving perfect stitches and problem-free sewing. True Tale: One of our staff members was chain piecing the diagonal seam of half square triangles for her quilt. She could hear a “thumping” as she stitched, and from the sound could tell that the needle was dull and having a problem piercing the fabric. But she had lots to do, just wanted to get them done, and figured she would change the needle later. Well, when she finished and cut them apart, there were snag lines perpendicular to the seams through all of the pieces. Since the fabric was a dark print, the snags showed light, and she did not have enough fabric to re-make them. So she decided to solve the dilemma by colouring in with a pigma pen all the snags. She certainly regretted not taking the time to change the needle earlier; it would have been a lot faster than colouring the snag lines, and working through the angst and disappointment. Revelation 2: There are different types of needles – one type does not suit all purposes. Revelation 4: As a result, you will need many different needles for different fabrics, sewing applications, and sizes of thread. Breakage of thread and skipped stitches are often the result of not having the right type and size of needle for the purpose. There is lots of information on the web about needles, and I can refer you to the Schmetz Needle site below, which is the brand we carry. We have most of their household types of needles available in many sizes. 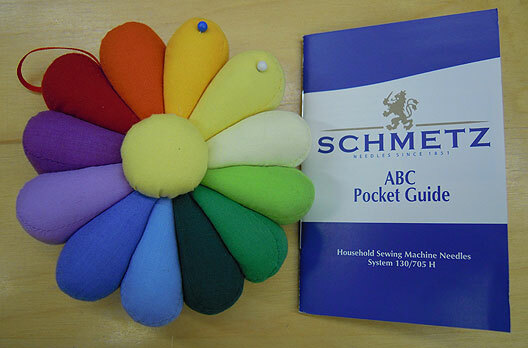 What is handier, however, is the Schmetz ABC Pocket Guide to needles. No need to turn on the computer to get the information you need. Revelation 5: What to do with those needles that you have used a little, but their time of usefulness is not over? Well, some of us use pin cushions which we’ve marked with the various types and sizes of needles to place them in. Others put all their needles in the appropriate sections. Everyone has their own way of organizing them. We have brought in these pincushions and the Schmetz ABC Pocket Guide for needles, and have packaged them together so you, too, can be informed and organized. Final Revelation: Want to keep track of what size/type needle you have in the machine? 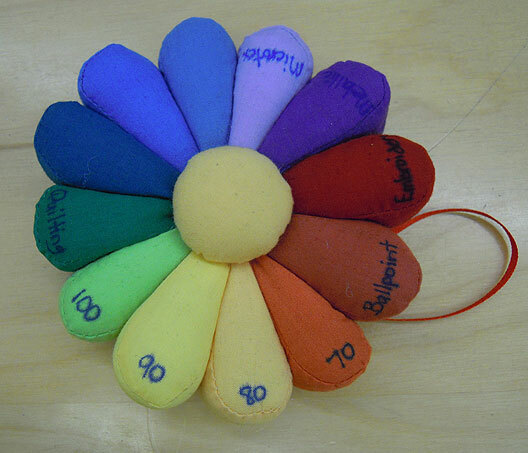 Use a distinctive pin, such as a hat pin, and place it in the corresponding segment in the pin cushion. It feels rather clumsy using a full-size pair of scissors when trimming thread tails. I find using a small pair of scissors or snips much more preferable. It allows me to trim precisely, and without fear of cutting more than I meant to. I usually use a spring-loaded snip, as it is even faster than a small pair of scissors, but there are times when scissors are preferable. Whatever is your pleasure, we have a few offerings. The “Embroidery Nipper” is not just for embroidery at all. 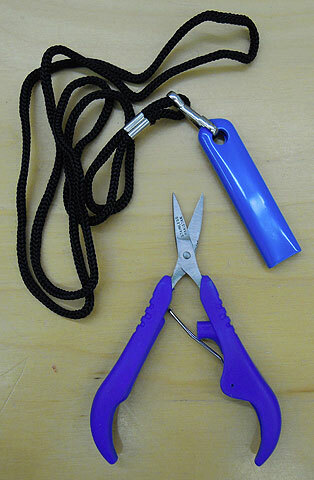 It is a spring-loaded type of snipper, that comes with a lanyard so you can hang them around your neck, and not misplace them. The spring can be closed as well, if you don’t want them permanently in the open position. Blade is 1” long, and the full size of the nipper is 5”. 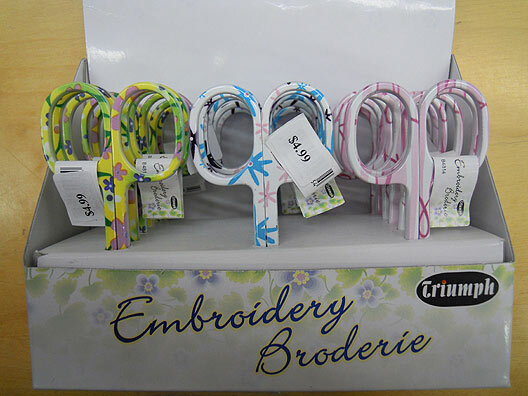 Last year we brought in some small floral scissors for Christmas, and they were a huge hit! So they are back for an encore. Sharp, fine, and inexpensive. 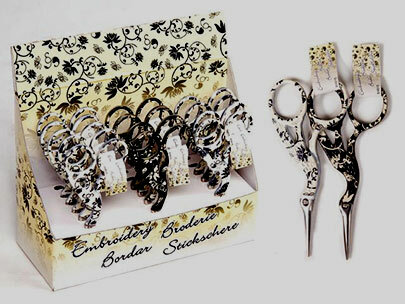 The same company that makes the small floral scissors, also makes small stork-style scissors. Again – sharp, fine, and inexpensive. Can you hear me screaming! Tape measures are the escape artists of the notion world, either slinking off the table, or hiding under the pattern or fabric. And if you’ve rounded one up, and cornered it in a compartment somewhere, it’s going to take another notion down with it when you pull it out. And that’s why they make retractable ones. Push a button, and the tape measure can’t get involved with anything. Add a lanyard, and it can’t get lost. Found and under control for a price of $4.99. 60″ on one side; 150 cm on the other. Stylish too; these tape measures match the stork embroidery scissors above, and together would make a nice paired gift. Snake tamers need not apply. Not a usual request, but it’s something we can accommodate! 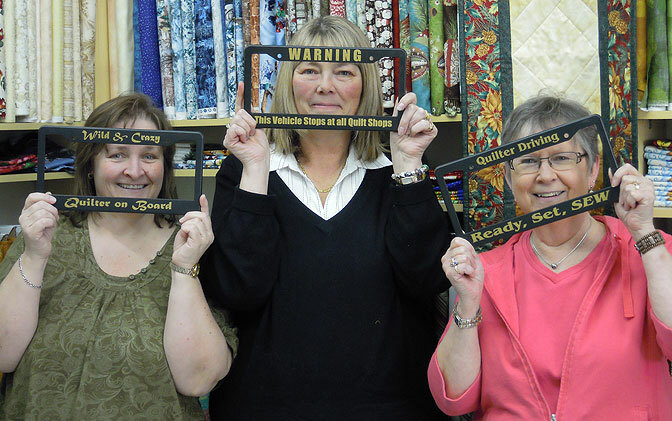 The picture of “framed” staff show the available sayings in black, and I bet one of them describes someone you know! 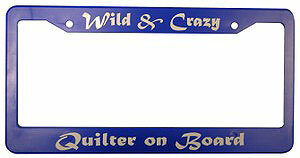 These plastic licence plate frames are also available in blue. 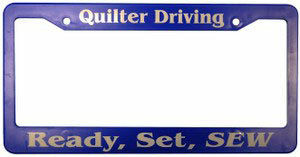 Would make a great gift for an obsessed quilter. Make a statement about your favorite hobby, instead of advertising for the car dealerships.